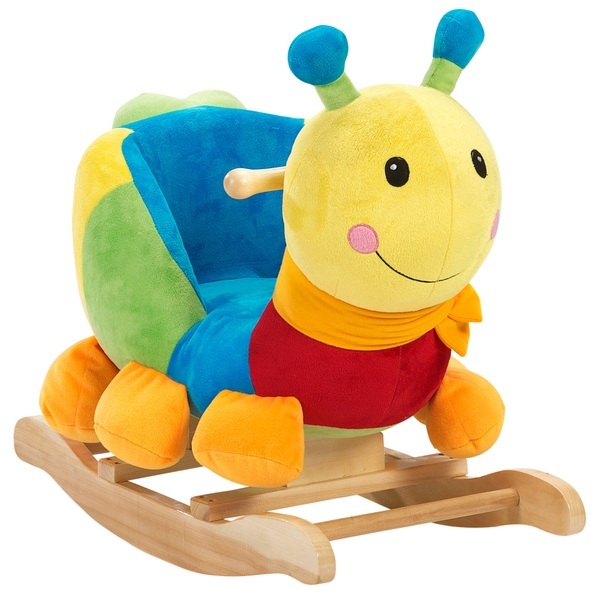 Tots will love playing on the Baby Rocking Caterpillar. This plush bug is soft, colourful and ever so lovable. This rocking toy will fit in beautifully with any playroom or child’s bedroom. The curved rocking frame and handles are made from handcrafted hardwood for a classic finish, while the cuddly body makes a cosy seat for little ones. The Baby Rocking Caterpillar gives kids the support they need to rock safely—and it’s super fun. The high seat back curves around to keep your little one supported on all sides. Comfortable padding and cosy plush fabric make this one popular caterpillar. The strength and durability of the frame ensure the Baby Rocking Caterpillar will last for years to come, making it a wonderful addition to any family home. EU Warning: Use under Adult Supervision. Keep away from Fire. Adult assembly required. Make sure the screws are firmly tightened. Check and tighten all screw and bolts periodically.